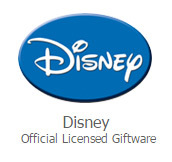 Supplied in Disney gift presentation gift box. A lovely keepsake or present. Approx. size 4cm x 3cm x 8cm (1½" x 1" x 3").